Featuring a variety of sponsorship and exhibition packages designed to maximize your organisation's visibility, the 3RD GLOBAL CONFERENCE ON ENGINEERING AND TECHNOLOGY (3RD GCOET) 2017 sponsorship and exhibition program provides even more ways to stand out from the crowd and make the most of your budget. 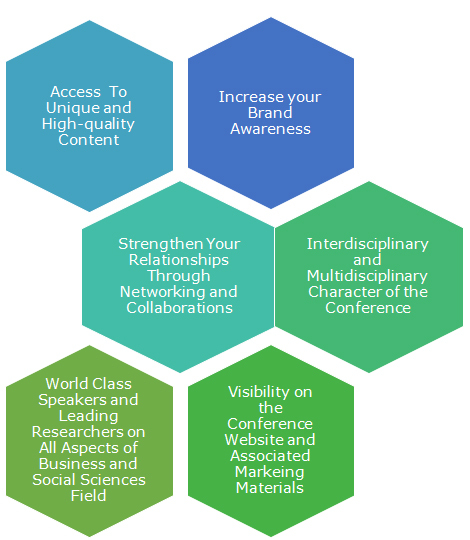 Whether you choose one of our exclusive packages or work with our team to create a package customized to fit your specific needs or desired investment level, our Sponsorship and exhibition Program will help you focus directly on your target audience in the conference. Choose from the following high-visibility sponsorship and exhibition packages, or contact conference marketing committee representative gcoet2017@gmail.com about customizing a package to fit your needs. Official appointment and announcement as the Corporate Sponsor in speeches during opening and closing ceremony. Company's logo prominently displayed on marketing collateral. Privilege opportunity to accompany the officiator & seating arrangement at the settee during the opening & closing ceremony. Full page color advertisement in the conference book. A speaker slot in one of the panel sessions/keynote address. Opportunity to display stand along banners at the event venue. Acknowledgement on the conference website. Official appointment and announcement as the Platinum Sponsor in speeches during opening and closing ceremony. Company's logo on marketing collateral. Invited to the opening and closing ceremony. Full page colour advertisement in the programme book. 1 Invitations to the Gala Dinner. Official appointment and announcement as the Gold Sponsor in speeches during opening and closing ceremony. Company's logo on conference with links to company website. Half page color advertisement in the programme book. Company logo at Dinner stations. Half page advertisement in the programme book. Company's logo on the backdrop during workshop. Company logo on booth stands. Logo & Web link on conference website. Company's name will be listed in the programme book. Company logo printed on each Delegate Bag. Conference and company logos to be printed on the conference pen and pad. Full page advertisement on the outside back cover of the Conference Program. Logo & Web appear in conference website. Company logo at lunch stations. Logo & Web appear in conference website. Company's name will be listed in the programme book. Company logo at Coffee stations. The Global Academy of Training & Research (GATR) in collaboration with University of Brawijaya (Indonesia), Springer (Germany), Inderscience (Switzerland), Elsevier (UK), APIDM (Australia), Kalasalingam University, (India) and Czestochowa University Of Technology, Poland, Cairo University (Egypt) is organizing the Global Conference on Engineering and Technology (GCOET) 2017 in Bangkok, Thailand .